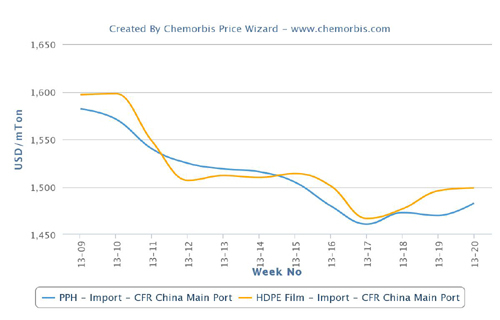 Several Middle Eastern producers started to reveal their PE prices to the Turkish market for July starting from late last week with decreases of up to $70-80/ton, according to ChemOrbis. A Saudi major also followed suit this week with decreases of $60/ton, although they are found too high to be accepted by buyers. A Middle Eastern producer’s new HDPE and LLDPE offers indicate a decrease of $70-80/ton when compared to June while LDPE posted a smaller decrease of $30/ton. A source from the company said, “Except for LLDPE, we are able to conclude deals albeit in smaller tonnages. Buyers prefer to secure half of their regular purchases pointing to their weaker end demand. However, expectations about further decreases are also pushing them to buy less than usual.” The source also added that they are not planning to lower their offers further for now regardless of the prevailing expectations. A buyer in Turkey also reported receiving July offers from a Saudi major, who offers from the bonded warehouses. “Even though new offers indicated a $60/ton decrease when compared to June, they are still very high, forming the top end of the overall ranges. Therefore, we are not planning to purchase for now,” said the buyer. Another Saudi producer is also offering $60-70/ton lower when compared to early June from bonded warehouses. “Although we are aware that our prices are a bit high particularly when compared to the offers on CIF basis, we are not in a hurry to lower our offers for our existing stocks in Mersin. I don’t mind building stocks until September considering the shutdown at our supplier in October-November,” said a source from the producer. 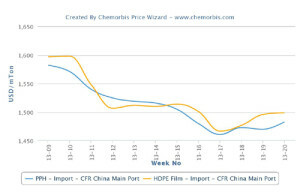 Unlike these two Saudi producers, another producer offering LDPE from Saudi Arabia commented, “We are beginning to feel some stock pressure as demand remains rather weak.” The producer’s offers display a decrease of $50/ton with respect to last month as per ChemOrbis pricing service.